Tyus Battle shoots during the first half of Syracuse's game against Wake Forest. Mandatory Photo Credit: USA Today Sports, Nicole Sweet. Over the weekend, 2018 center Osun Osunniyi announced he was attending St. Bonaventure, picking the Bonnies over an offer from Syracuse, among others. Brad Bierman wrote yesterday that the only question remaining for the Orange for the roster is whether Tyus Battle is coming or going. But all indications are that Battle is going to remain in the 2018 draft, so let’s operate under that premise as we look at what’s on SU’s roster heading into next season. Four of its five offensive starters return, and each of the four returners is expected to take at least incremental, if not giant, steps forward. Howard made the biggest improvement of the bunch in his junior season, increasing his production across the line from points (4.5 to 14.4 ppg), assists (3.6 to 4.7) and rebounds (1.7 to 3.5). Howard can take another big step forward in his final year at SU by limiting his turnovers (3.4 per game) and shooting percentages (37.6 from the field, 32.7 from 3). Brissett enjoyed a standout freshman season (14.9 ppg, 8.8 rpg) and figures to make the next step into stardom in his second year. Whereas Battle was the top offensive option in 2017, that role will fall to Brissett in 2018. With more offensive options around him, Brissett can catapault his game into stardom by improving his efficiency, especially from the 3-point line (33.1 percent). Dolezaj was the biggest beneficiary of Darius Bazley’s defection to the G-League. He gained more confidence throughout the year, culminating in a 17 point performance in a 57-52 upset win over TCU in the first round of the NCAA Tournament. While Brissett is the most heralded among the group to improve, Dolezaj’s game could improve even more. While no one is expecting Chukwu to suddenly become an offensive force, he will still be one of SU’s most critical players on defense (2.5 bpg). Finally, the coaching staff has been raving about Hughes, who appears to have a similar skill set to Battle. He can score off the dribble or spotting up, and is also a capable defender at the top of the key, with the versatilely to play wing. The real difference will come from SU’s bench, which gave the Orange virtually no production. Syracuse coach Jim Boeheim will have the most options he’s had in years, with an ability to mix and match depending on what he needs. Freshmen Jalen Carey, Robert Braswell and Buddy Boeheim all appear ready to contribute right away. Braswell has the best path to playing time, since he will be the first wing option off the bench should Dolezaj or Brissett get into foul trouble. Carey may supplant Howard Washington as the primary backup, a combo guard with a college ready offensive game. 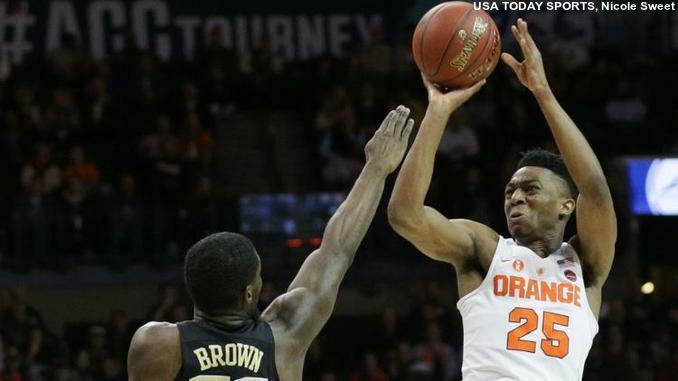 That might leave scarce minutes for the younger Boeheim, but Buddy possesses a skill that no other Orange on next year’s team will have: A top-flight long-range touch, which may make it difficult to keep him buried on the bench depending on the situation. Washington was starting to earn the trust of the coaching staff last season before tearing his ACL in February, and can certainly provide quality minutes as well. Bourama Sidibe underwent what appears to be successful offseason surgery for tendinitis in his knee, and if healthy, gives the Orange a viable low-post offensive option. The only real downside of losing Osunniyi is that SU loses an insurance policy if Sidibe is limited again in his sophomore campaign. So, all in all, even with the loss of Bazley, Osunniyi, Matt Moyer (transfer to Vanderbilt) and potentially the loss of Tyus Battle, the Orange figures to still be stronger and deeper than they have been in recent years.